Join Cory Bryant for Yoga Nepal, Fall 2017! — YOGANEPAL.com - Join Our 10-Day Yoga Retreat & Life-Changing Pilgrimage in Nepal! Cory grew up in the 1970s-80s farm country of Southern Indiana. The oldest of four boys, he and his brothers spent their days exploring in the woods and playing games in the fields. It was a time that generated deep love and respect for family, animals and the earth. After high school he left home to study at Purdue University – a venture that turned into 11 years of higher education and a move to Massachusetts for his doctorate. Cory’s spiritual journey began in 1998 when a friend gave him a book on Buddhism and a statue of the Buddha. Then, in 2002, while living in New York City and after experiencing first-hand the horror of 9/11, he turned to yoga. Initially with a soft introduction at the Integral Hatha Yoga Institute in the West Village and then with the mind-blowing experience of Jivamukti Yoga. Since that time, pretty much everything about the way he views the world has been challenged, bringing with it transformation from a goal oriented, judgmental, high-tempered, career driven individual to the more even minded person he humbly aspires to be today. On his first day back from Jivamukti Teacher Training in 2008 he started teaching at Flow Yoga Center in Washington, DC and hasn’t stopped since. Over the course of these years his commitment to practice and teaching has continually deepened and in December 2015 he resigned from an international food policy position at the U.S. Food & Drug Administration to pursue yoga study, practice and teaching full-time. He is blessed to share his life with his husband of 15+ years, Richard, and their three crazy fun dogs, Lola, Spanky and Bodhi. Ashtanga Vinyasa Yoga coupled with Tibetan Buddhism form the foundation for Cory’s personal practice and it is from there that he offers teachings. He describes himself as a liberal traditionalist - striving to be open minded and accepting and at the same time placing great importance on discipline, faith, devotion, humility, learning, and tradition. As such, he attributes much of his capacity to teach yoga to his teacher, David Garrigues. Cory apprentices with David throughout the year and spends as much time as possible with him to soak up his teachings and become a better teacher. Cory has been leading Yoga Nepal pilgrimages since their inception in 2010. On that first trip he met the monk who has become his main Buddhist teacher – Tokpa Tulku (who you’ll have to good fortune to meet as well!). His support for Cory’s yoga practice and his gentle guiding energy is an important force in Cory’s daily life and practice. 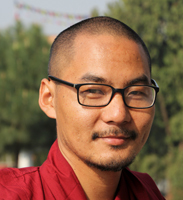 Khenpo Karma Gyurmey (Drokpa Tulku) was born in 1978 in Nubri in northern Nepal. In 1987, when he was nine years old, he was ordained as a Buddhist monk at Ka Nying Shedrub Ling Monastery in Boudhanath, Nepal. There he pursued his elementary studies, which included memorizing many texts and learning the monastery's tradition of chanting. In 1998 he commenced studies in the monastic college at the Sangye Yeshe Higher Shedra. He studied there for nine years, focusing on texts related to sutra- and mantra-level Buddhism as well as general fields of study. Currently he teaches to those who are interested in Buddhist teachings, both ordained and lay, from both East and West. Joanne Larson was a Peace Corps volunteer in Nepal in the 90's. The experience stimulated her interest in Buddhism, prompting her to later move to Nepal to study at Rangjung Yeshe Institute (RYI) in Boudhanath. Today, she is the Director of Programs at RYI. A gifted teacher, she communicates the often complex history and philosophy of Buddhism in language we can all understand. Joanne has contributed as an editor to translated works on Buddhist philosophy and holds an MA degree in Buddhist Studies from the University of Bristol. Anil Chitrakar trained as an engineer and energy planner and has been at the forefront of numerous projects aimed at economic, social and environmental sustainability in Nepal. 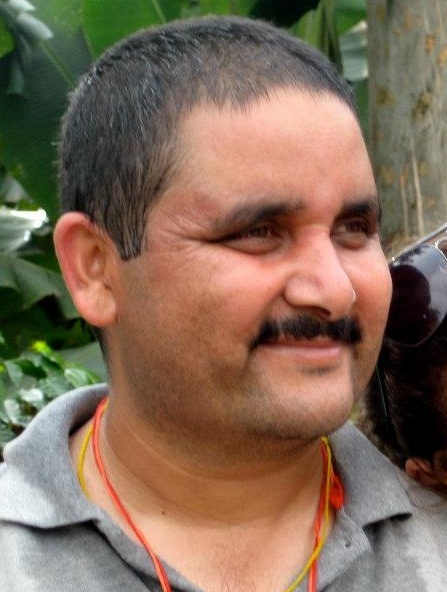 Anil was also born to a family of artisans and loves sharing his knowledge of Nepal's rich cultural heritage. He's worked closely and tirelessly with local artisans for the preservation of the arts, crafts and living heritage of the Kathmandu Valley and offers a rare, "behind-the-scenes" look at life in the Malla cities. James Hopkins has been traveling and living in South Asia for the past 18 years. In 2004, James moved to Nepal where he studied Buddhist philosophy and Himalayan languages at Ka-Nying Shedrub Ling monastery. He now works at the monastery as the Director of Development – gathering support for the activities of the monastery around the world. In 2006, he started a microfinance project in an encampment of street beggars (Quilts for Kids Nepal) which now provides jobs for economically-challenged women and sponsors the education of about 40 children from that community. James has a great hands-on knowledge of the Hindu and Buddhist holy sites of the Kathmandu Valley and enjoys sharing it with visitors. Bidur was born and raised in Nepal and received his Bachelor's degree from Tribhuvan University. He also completed the Nepali government's tourism training course, and since 1999, has worked for Royal Mountain Trekking Nepal (p.) Ltd as a tour guide and program planner. For more than 4 years, Bidur has been an essential member of the Yoga Nepal team, handling all transportation details and supporting us on hikes. Bidur recently completed his Masters degree in Buddhism and Himalayan Studies at Lumbini Buddhist University in Kathmandu. Sign Up for Upcoming Retreat Updates! Many of the images featured on this site are courtesy of Tania Dolvers Photography. Copyright © 2010-2017, Traveling Yogis, LLC. All rights reserved.